This morning I woke up this morning at 6am when your Daddy came in to make sure I was getting up for the day. He always gives me a kiss goodbye and says “I love you” when he leaves for work. It’s important! When I looked over at you sleeping in the bed next to me, I realized that we were both laying in exactly the same position on the bed with the sheets kicked to our feet, and it nearly made me cry to think that I was blessed to have YOU in my life, to have YOU as my daughter. My gosh I love you. 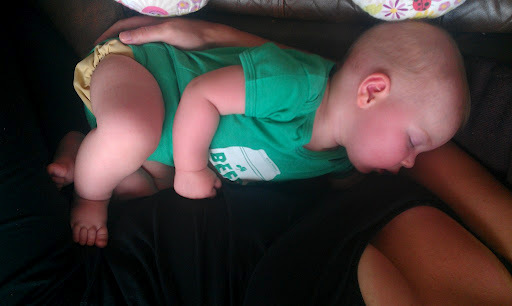 Your Auntie Jaime and I were talking today about how we cannot believe you will be seven months old this weekend. It is just insane to think it has been that long (and that short?) of a time since you joined us. You are such an important part of our lives! We are full on in summer mode over here, and this weekend was filled with pleasant evenings outdoors, 4th of July celebrations, and lots of time with family and friends. You love being a part of the action, and if we hold you facing in, you constantly are pushing away and off of us to look around. Same goes for your toys on the floor – you’ll sit for a bit just playing contentedly, but pretty soon you’re on your belly and 3′ away, checking out something else. 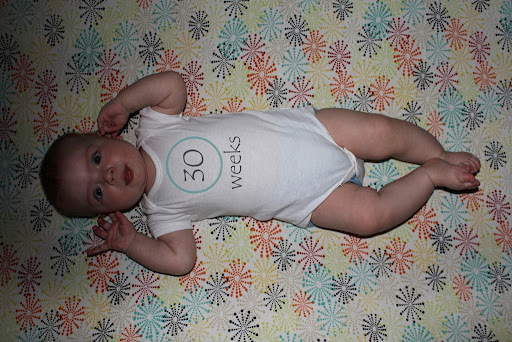 It’s amazing to see you start moving around more (especially since you still refuse to roll the majority of the time!). Also, you are SUCH a ham with people – I know I say this almost every week, but people constantly comment on how happy you are. Your big, gummy smile just lights up the room! You may not be the best napper or night time sleeper, but your time awake is spent being a happy and social baby, and I wouldn’t ask for anything different. We love you so much! Playing “patty cake” with Nana Joan on the front porch when I got home from work. 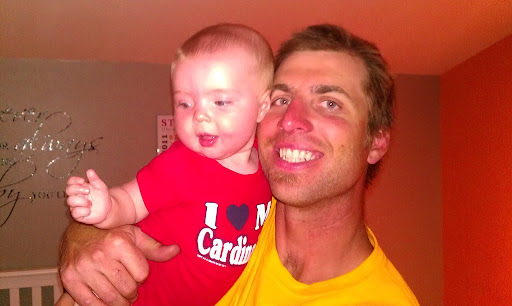 Getting ready for bed with Daddy and showing off your Cardinals gear! Enjoying your first river festival last weekend. 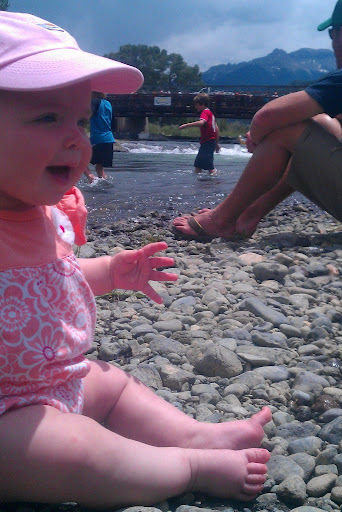 You loved checking out all the rocks and water! 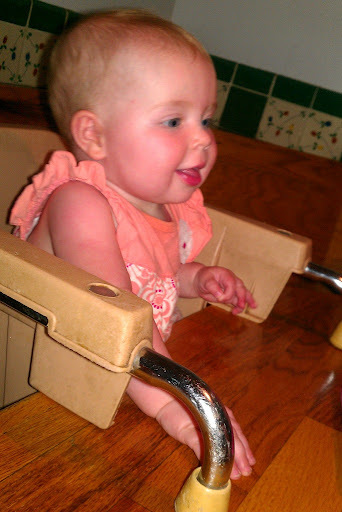 Sitting in the big girl chair at the local restaurant we always eat at. You loved it! Family time on the couch! Thanks Amanda for the onesie. 🙂 HFS!! Decked out in red, white, and blue for your 1st Fourth of July celebration! LOOOOVING your holiday meal. You ended up devouring your burger. Carrots are still the least liked, and I don’t know if it’s because it’s pureed or because you just don’t like them. Love you so much Stella!! Hi there. What a great update. Love how you write these to her. I might copy that idea, i hope that's OK. I think it's so endearing. Love all the pictures, especially the 4th of july. She's super duper cute. She really is such a doll! I love that you gave her a burger patty to attack. Tay eats cut up burger. Maybe I should just let her go for it. She is such a big girl eating burgers and such. She has so much personality. 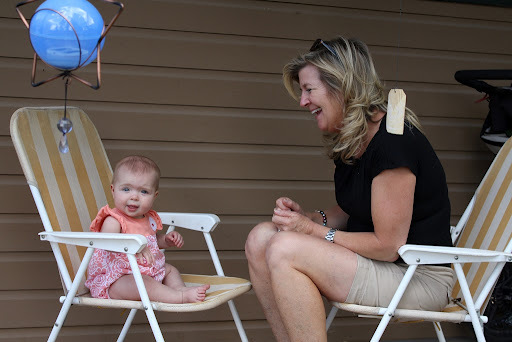 Just look at her in that photo on the porch sitting up laughing away like she's a mini adult just hanging out. So much personality I tell you. 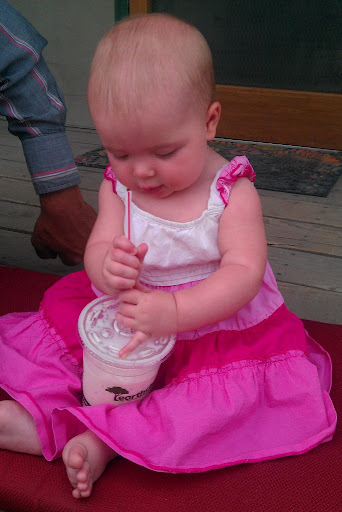 I want to start giving Emily "real" food (we do purees) but I'm so scared she'll choke, did you ever worry about that? Oh my goodness, she's just adorable! I love seeing the food she eats – amazing!!! First – she is adorable, love the updates! 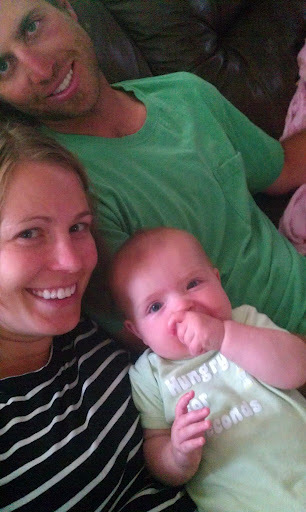 Second – we are getting ready to start solids in a couple weeks and I have the same fear as Bridget, choking? Were you worried about this? How did/do you overcome that concern? Thanks! I just emailed Bridget – I should have replied here I guess. :)Honestly, no, I haven't worried about choking. Part of the beauty of BLW is that babies learn to gum/chew food before they learn to swallow (instead of with purees, where they learn to swallow before learning how to gum/chew). Stella has gagged maybe once or twice in the past month, but that is it (and gagging is good – it's them learning how to move the food forward in their mouths to gum/chew it more). We just make sure we are always sitting with her when she eats, but that's as much to make it a "family dinner" as it is to keep an eye on her for choking. She really does well with it, I think b/c she has been learning how to gnaw on everything since the very beginning! Is it possible that she is getting cuter each week?! I love watching her personality grow through all the photos! Babies sitting up melt my heart with their little grown up looking cuteness. I love that she gobbled the burger up!! I told Anthony this and he is excited to get Alidia on the burgers soon. I hope she likes them as much as she likes bananas. Yesterday she devoured pretty much a whole banana. The kid is going to turn into one soon! Thanks! 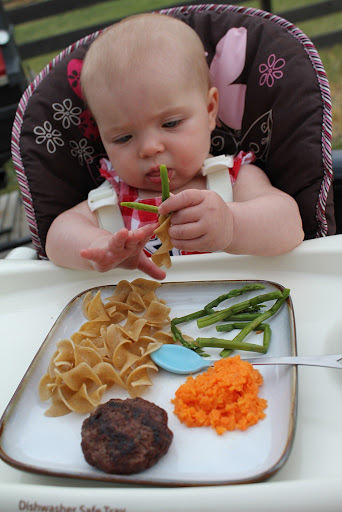 I ordered the baby led weaning cookbook, so I am looking forward to reading more! She is so adorable! And getting to be such a big girl. Look at her dinner. Seriously, I don't think she could be any cuter. 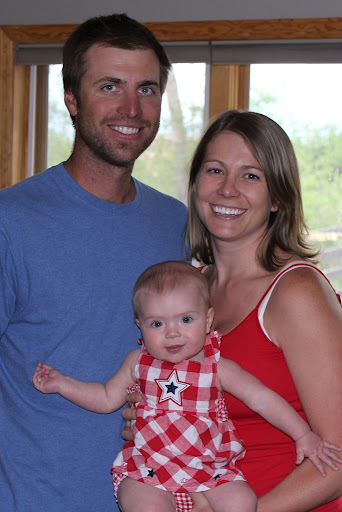 ← WWW 30w pp – Happy 4th of July!